This is a sponsored post. I received complimentary tickets for this event. All images are copyrighted and used with permission. Opinions on this blog remain honest and my own. This was my girl's last summer to be a little kid before she starts school in September so I planned a few small day trips to help make this a summer to remember. On July 21 we drove three hours to attend the Day Out With Thomas 2013 Tour stop in St. Thomas, Ontario. Everyone was grateful that the heat wave had finally broken, but it was still a warm summer day. We arrived 2.5 hours before our train ride and set out to explore the family friendly events surrounding the St. Thomas-Elgin Memorial Arena. the there to greet the children as they entered the grounds. After this meet and greet, we went to see the animals in the petting zoo area and got a snack at a food truck. 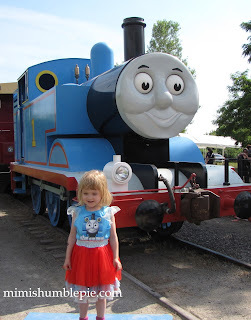 Princess wore her favourite dress and we were stopped by a few dozen families asking where she got her unique (girly) Thomas outfit. 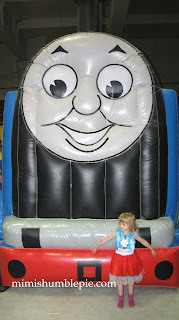 were met by the giant inflatable Thomas jumping castle. After a few times bouncing through Thomas, our Princess went to get a temporary tattoo, play with some Thomas play sets, and visit the Gift Shop. 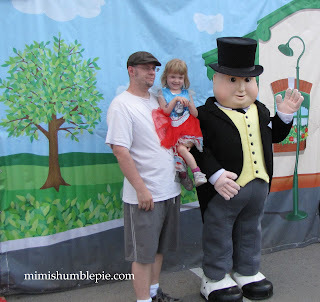 I ended up carrying her jumbo Thomas balloon for the rest of our tour. Tip: Buy the balloon right before leaving the grounds. out cards with information so families could order post-event pics. Soon it was time to line up to board Thomas. We enjoyed our scenic trip through beautiful St. Thomas and stopped for a photo opp after dis-embarking. As we left, volunteers handed out coupons for local restaurants and a sticker book. Those stickers helped entertain Little Miss on the long ride home. This is a day that will not be forgotten too soon, we will be ordering some of the photos snapped during our tour of the event. I would like to say a special thank you to the volunteers that helped make this day a fun and safe family event for everyone. This special train ride doesn't happen very often so don't miss out, book your tickets today. 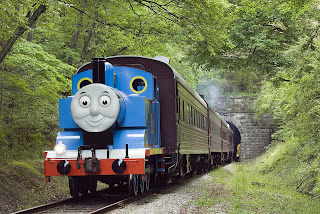 Visit thomasandfriends.com to find an event in your area.